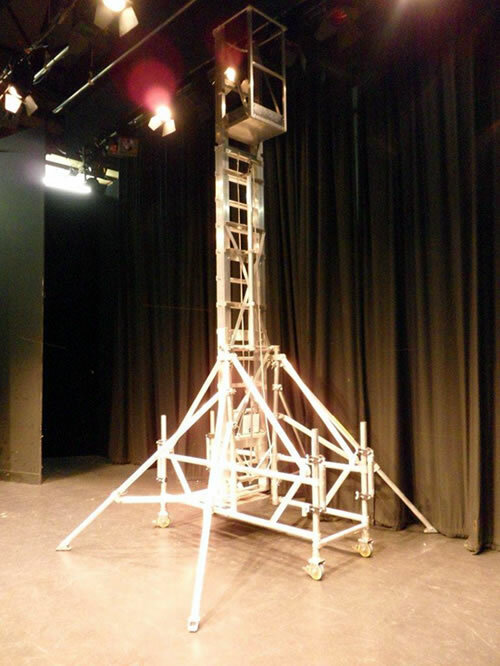 Since the ABTT withdrew its Code of Practice in view of the HSE’s concerns , much work has been carried out by the theatre industry, not only on Tallescopes but also on other methods for working at height in theatres. Involved parties were the Theatrical Management Association (TMA), The Federation of Scottish Theatre (FST), the Association of British Theatre Technicians (ABTT), the Ambassador Theatre Group (ATG), the manufacturer of the Tallescope, Aluminium Access Products (AAP) and a number of other theatre organisations from Scotland and Wales. HSE were also involved. Selection of equipment for work at height in theatres should follow the hierarchy shown in Regulations 6 and 7 of the Work at Height Regulations 2005. The following, depending on individual circumstances, are examples of reasonably practicable methods for working at height. No work at heights - Remote or low level focusing of lights. All scenery etc completed at ground level and lifted into place. Work from existing workplace - Existing gantries, walkways, catwalks or trampoline grids. Work platforms - Mobile towers and MEWPS. Work positioning - Fixed length wires and harnesses. Fall mitigation - Airbags/nets etc. Fall protection using inertia reel harnesses or similar. Rescue plan must be in place. Other equipment requiring detailed systems of work - Ladders, Zarges, Tallescopes etc. Following the work referred to previously, the ABTT have now released their revised ‘Code of practice for the selection and use of temporary access equipment for working at height in theatres’ and a new ‘Code of practice (COP) for the use of Tallescopes for working at height in theatres’. Both titles contain a great deal of information about the topic generally, including the use of Tallescopes. The ABTT have kindly offered to give free copies of this guidance to all Local Authorities, please email ABTT direct at tallescope@abtt.org.uk making sure you include your full name and official address. Members of the Joint Advisory Committee for Entertainments (JACE) may also request copies and should email ABTT direct at workatheight@abtt.org.uk making sure they include full name, job title and official address. The ABTT, an independent association offering guidance on safety in theatres, has issued the new COP about the use of Tallescopes. This was written taking into account expert opinion from within the industry and a number of technical studies from both internal sources and HSL. HSE strongly recommends that users follow this guidance and the system of work outlined therein when using this equipment and will continue to support enforcement action where necessary to ensure Tallescopes are used safely. A set of 4 castor wheels which do not ‘lift’ when the brake is applied. A set of 4 pushing bar extensions which stand vertically at the 4 corners of the base frame. At least two methods have been developed and are available for rescuing a person who becomes incapacitated whilst working in the cage of a Tallescope. Research continues into other options for working at height in theatres but the differing types and designs of theatres makes a generic method unlikely. HSE will publicise the detail of this work as it becomes available.